FORT LAUDERDALE, FL—November 11, 2016—ITSM Academy is proud to announce The DevOps Institute (DOI) new DevOps Practitioner℠ series of courses will be added to our training catalog in 2017. This series of courses is to support IT roles for the modern enterprise. Each new DevOps certification course is focused towards continually addressing the emerging and growing needs of IT professionals and organizations worldwide. 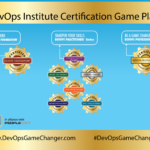 The existing Certified Agile Service Manager (CASM)® and Certified Agile Process Owner (CAPO)® qualifications will also become part of the DevOps Practitioner series of courses. Certification exams for each course will begin to be available in Q1 2017. ITSM Academy is also proud to participate in DOI’s new digital badge program for all DOI course offerings. Learners who have passed DOI’s qualifications will be awarded a digital badge as a means of showcasing their achievements. Learners will be able to share their success online by displaying digital badges via Facebook, LinkedIn, Twitter, Mozilla or other social media sites. Alumni who have already passed DOI certification exams will be issued digital badges retrospectively.